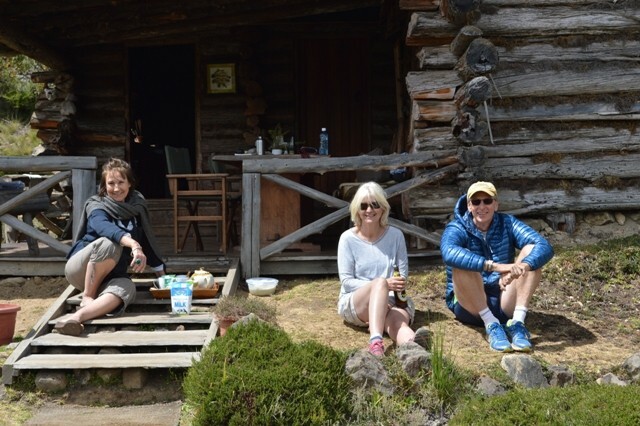 We had come to Rutundu, some 10,200 ft above sea level on the northern flanks of Mt Kenya, to enjoy the mountain scenery and the pleasure of staying in log cabins where wood fires and hurricane lamps were the sole source of heat and light. We had also come to fish, and as soon as dawn broke on our first morning Jo Harrison – a serious fisherwoman with a trout stream of her own in Hampshire – and I clambered down a steep gorge in the company of Cosmas, one of the Rutundu staff. The narrow stream was so hemmed in by vegetation that it was impossible to cast, so we let our lines run downstream, tweaked the flies around and hoped for a bite. It was bitterly cold and globs of ice formed on the rod rings when we reeled our lines in. By the time we returned to the log cabins, fishless but exhilarated, the sun had risen and our spouses were knocking up bacon and eggs. After breakfast, we set off for Lake Alice, some 1700 ft further up the mountain. 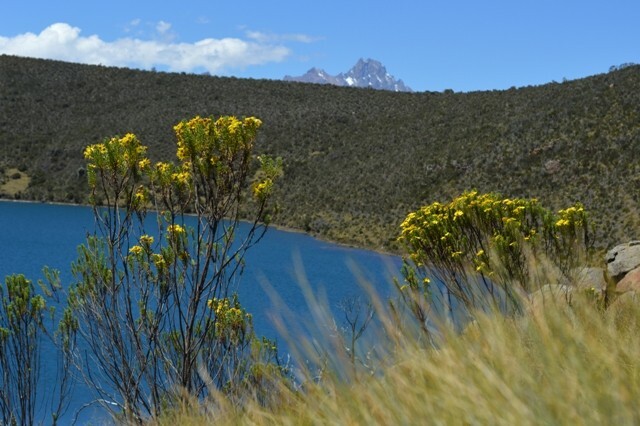 On the steep ascent we frequently stopped to catch our breath, gaze at the rugged outline of snow-streaked Batian, Mt Kenya’s highest peak, and admire the chaparral vegetation of protea bushes, giant groundsel and chest-high heather. At this altitude, the fauna and flora are less diverse than in the planes below, but there is still much to enjoy. On the way up to Rutundu we had passed small herds of zebra and eland. At first light, we had heard a leopard’s breathy growl. Giant kingfishers patrolled the streams and malachite sunbirds, much larger than their lowland cousins, sucked pollen from the large protea flowers. Stillwater fishing does not appeal to me in the way that river fishing does, but it was thrilling to catch a decent rainbow trout in this landscape, in the company of friends and family. It was, as it happens, the only fish we caught. After a languid picnic lunch, some gentle chatter by the lakeside and a bit more fishing, we set off for Rutundu before the afternoon clouds rolled in. 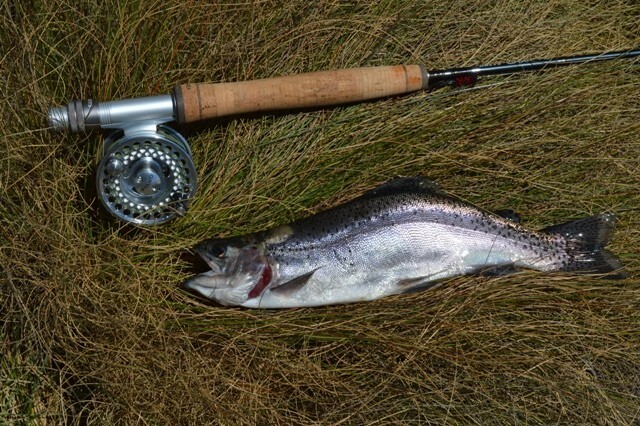 On the way down, as I was reflecting on the effort expended on the catching of one fish and the pleasure it had given, I recalled a conversation I had had with Dr Nick Fox, scientist, conservationist, falconer and farmer, a few months earlier. I had visited Nick at his farm in west Wales in the company of Jim Barrington while researching The Facts of Rural Life. He is one of the more interesting thinkers on countryside matters, and our conversation over dinner – a stew made from a brace of pheasants which he had shot from his bedroom window while still in his pyjamas – focused on the ethics of field sports. There is a great difference between killing animals because they are considered a pest and killing animals for sport. When it comes to pest control, the more that are killed the better: if you hire Rentokil to tackle the rats in your barn or your house, you hope to get rid of the lot, not just a few. “But if we are pursuing – or killing – animals as a field sport, then I think we should do everything we can to maximise pleasure while reducing the number of deaths,” said Nick. I asked what this would mean in practice. “Well, if you take foxhunting, this could involve 100 or more people on horseback or foot spending an entire day in pursuit of one fox, which might, or might not, be killed by the hounds.” If the fox is killed above ground the death will be swift. The collective enjoyment derived from the day’s hunt, in terms of person-days of pleasure, will be considerable. Contrast this, suggested Nick, with shooting. Large-scale pheasant shoots might involve the deaths of scores of birds for each shooter. There is also the wounding factor to consider. “I’ve often followed after shoots and found evidence of serious levels of wounding, with the dogs failing to find pheasants that have been shot, but not killed,” he said. Nick is the only scientist to publish a peer-reviewed study investigating wounding rates associated with shooting foxes. Bear in mind that before hunting with dogs was banned by the 2004 Hunting Act, hunts accounted for around 16,000 foxes a year in England and Wales. Around ten times that many were killed with rifles and shotguns. “My study showed that wounding rates are often horrendously high,” said Nick. Indeed, his paper (Wounding rates in shooting foxes. Animal Welfare, 2005, Vol. 14, No.2) suggests that shooting foxes with shotguns maims as many as it kills. More about this in The Facts of Rural Life. Suffice it to say here that the League Against Cruel Sports and the anti-hunting scientist Stephen Harris claim that shooting is the most humane way of killing foxes, despite evidence to the contrary. Of course, gamebird shooting provides many collateral benefits. Shooting estates are more likely to plant and maintain copses, hedgerows and cover crops than non-shooting estates, all of which is good for biodiversity. The presence of gamekeepers – see, for example, my blog on a Yorkshire grouse moor – also helps to protect a wide range of ground-nesting birds, such as curlew, lapwing and golden plover, as well as the quarry species. And, of course, shooting provides significant economic benefits and rural employment. Back at Rutundu, after hot baths and some restorative shots of whisky, Mike Harrison cooked our catch of the day in the embers of a log fire. Scented with herbs and sprinkled with lime juice, the pink flesh provided a memorable hors d’oeuvre. 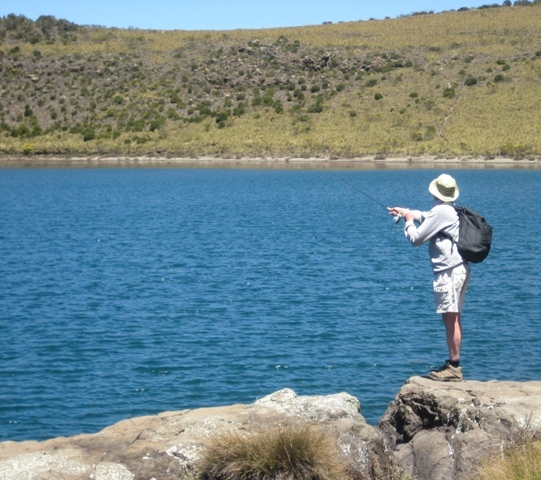 Seldom can one fish have given greater pleasure, when measured in terms of the hours spent hiking, fishing and dreaming in one of Africa’s great landscapes. Nick Fox, I feel sure, would have approved.